I am writing to let you know why my team deserves free lunch for NPSTW. My hat goes off to all the dispatchers in every center. Our job is truly one of the most demanding, stressful, thankless positions there is in a police department. And most of us make it look effortless. Thank you for all you do! This year (and every year) my team continues to awe me with their commitment to teamwork, dedication and to developing our trainees to succeed and thrive in this industry. Like a lot of communication centers we have also had our struggles with staffing. 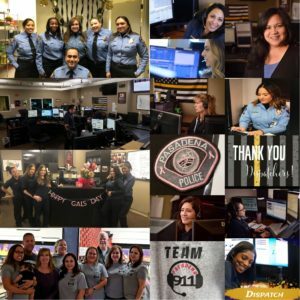 Since last April our dispatchers have not only worked their shift, overtime (some forced) they have also been tasked with rotating and training 7 new dispatchers, 3 light duty officers for over 8,400 training hours. Of the six, two have completed training and are now working on their own and thriving, perfecting their technique; 4 are progressing, learning the ins and outs of our profession. Anyone who has trained knows the sacrifice that goes into training the future of our departments, without the professionalism, dedication, hard and demanding work of our dispatch trainers our trainees would not make it in this profession where you have to learn a “new language”, handle not only difficult calls/callers but sometimes difficult officers, multitask and always be at the top of your game… then come back the next day and do it all over again. Without the teamwork and camaraderies we build with each other it would make facing the day to day dismal. I am thankful for every one of my teammates who make being a dispatcher a profession to be proud of.